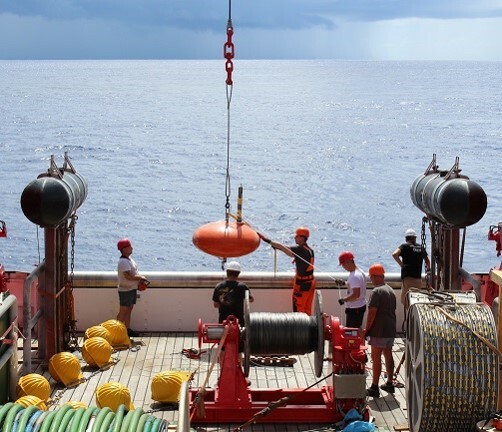 My principal research interests of studying internal waves, turbulence and diapycnal exchange through oceanographic observations have resulted in developments of seagoing instrumentation. These developments explore such highly three-dimensional flows mainly using Eulerian mooring techniques. Until now, I find Lagrangean observational techniques too complex to be used in the ocean interior, and other hybrid observational means leading to difficult quantifiable studies of physics processes. The available facilities and enthusiasm of NIOZ-technicians and Post-doctoral fellows like Louis Gostiaux, Andrea Cimatoribus and Frederic Cyr generated a creative atmosphere. In close collaboration with electro-technicians, especially Martin Laan, software-engineer Frank van Maarsseveen and fine-mechanics engineers Johan van Heerwaarden and Roel Bakker NIOZ high-resolution temperature sensors were developed. With several NIOZ-sea-technicians led by Lorendz Boom they were also involved in the development of new mooring techniques like thin-line moorings, self-unrolling moorings and (un)foldable 3D moorings.